Need something to do while waiting for that new Star Wars: The Last Jedi trailer to drop? We've got you covered. 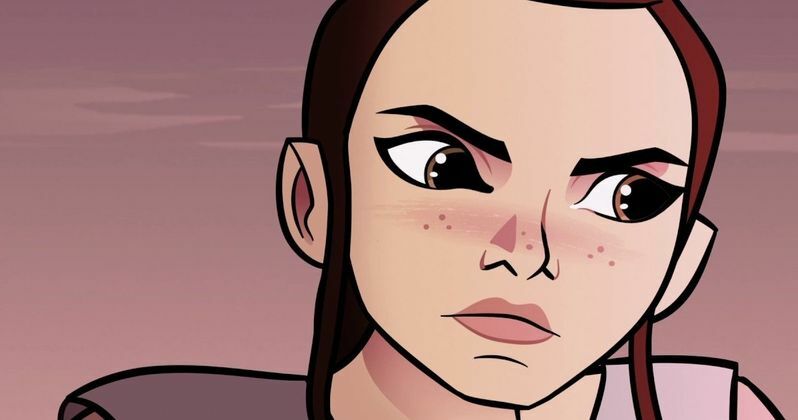 Disney and Lucasfilm have released the first Star Wars Forces of Destiny animated short online. Titled "Sands of Jakku," the short features Rey and BB-8 during the events of Star Wars: The Force Awakens shortly after they met trying to escape from a giant, deadly alien worm. And this short finally answers one of the many questions from The Force Awakens. The first episode of Star Wars: Forces of Destiny arrived a bit early on the Disney YouTube channel, though, it was scheduled to go up today anyway. "Sands of Jakku" is going to roll out today online and will debut on July 9 on Disney Channel. The series of shorts, which will clock in between 2-3 minutes in length, will feature the female heroines of the Star Wars universe, most of which who are voiced by the actual actresses that play them in the movies. In this case, Daisy Ridley returns as Rey and, in the intro, we hear Lupita Nyong'o as Maz Kanata, who has the honor of saying the title of the show. The short itself is pretty much two and half minutes of animated action and adds a little bit to Star Wars: The Force Awakens, serving as a deleted scene. Shortly before Rey meets BB-8 in the movie, there is a bizarre hammer-headed creature peeking its head out of the sand at night, which BB-8 rolls past. This short reveals that said creature is actually a nightmarishly huge alien worm, sort of like a combination of what we know from Tremors and Dune, except that this one likes to eat junk instead of humans. So BB-8 is in serious trouble. Not that this was ever actually in the script for The Force Awakens, but this would have been a rather expensive sequence to shoot. But this "Nightwatcher Worm" would have been pretty cool to see in live-action. Despite being short, this does feel like an actual Star Wars thing. Dave Filoni, the creative force behind Star Wars: The Clone Wars and Star Wars Rebels, is also involved in Star Wars: Forces of Destiny, so that is probably one of the main reasons this feels like a genuine piece of storytelling and part of the official canon, and not some rush job just to entertain kids who may be watching Disney Channel for a few minutes. Aside from Daisy Ridley returning as Rey and Lupita Nyong'o as Maz, we are also going to be getting Felicity Jones back as Jyn Erso and Ashley Eckstein as Ahsoka Tano. Padme Amidala and Princess Leia are going to be appearing in Star Wars: Forces of Destiny as well, but other voice actors have had to step in to fill those roles. Shelby Young will be filling in for the late Carrie Fisher as Leia in the shorts, with Catherine Taber stepping in for Natalie Portman as Padme. Be sure to check out the first episode of Star Wars: Forces of Destiny for yourself below.